Lead acid battery’s are the most expensive technology in our vehicles on a $/mile basis. 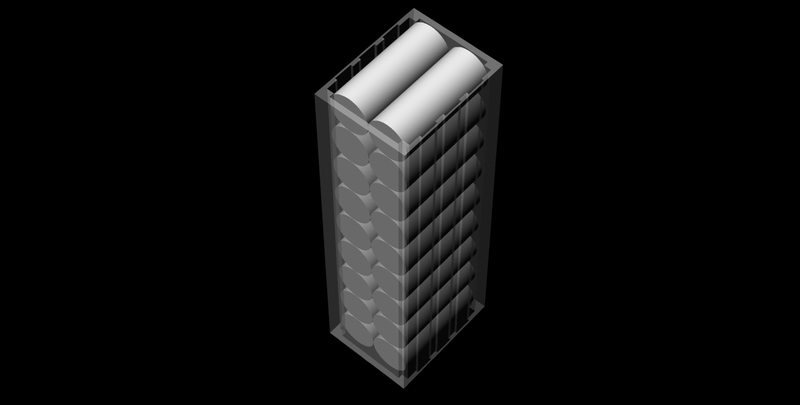 If a good lithium pack could be assembled, it would make for a lighter and far more efficient vehicle. In the near term I’m building Lithium modules from ten A123 cells in parallel. That’s a 23ah module. Not much harder to make a 20 cell/46ah module. I’m guessing based on my records, that my truck could go 40 miles max on 23ah since the pack would be so much lighter than even the nicad that I currently have. 70-80% of 40 miles is 28-32 miles. That’s a reasonable range for my city driving needs. Each 10 cell module will run about $125 in just cell costs. That’s $3250 for 154lb bare pack. There still has to be a housing of some kind designed to hold the module. It will use up just one half of the battery box. Leaving the other half for another pack as funds allow. Factory packs weigh from 1400-2200lbs. Can you imagine the range and efficiency increases from loosing up to a ton of pack weight?? 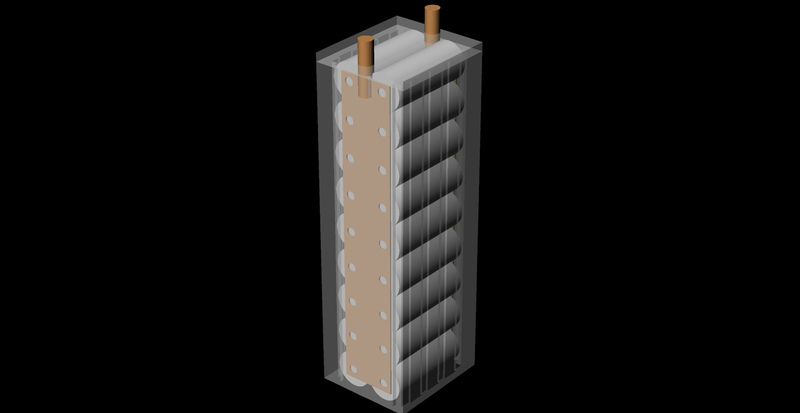 CAD model of 20 cell A123 module. Displaces 2 flooded BB600 nicads. Right now the large format cells that most EV folks are using, have very poor regen capabilityof around 0.3C. On a 100ah cell, that’s only 30 amps of regen allowed. Our vehicles have up to 200a with stock settings. 250 amps with modified settings. A 10 cell module can handle 100 amps of charge/regen current for 15 minutes at a time. So I can easily see them handling 200 amps for 5-10 seconds when regen kicks in with modified software, under specific conditions. In other words they are very low impedance cells that can handle our regen needs nicely. As for discharging, the A123 10 cell module can handle 700 amps of discharge continuously, and up to 1200 amps for 10 second bursts. Our vehicles can only discharge at 200 amps stock or 250 amps in a modified configuration. Here is the data sheet from A123 on this cell. These cells have a very long cycle life. 1000 cycles at the max ratings listed. Double that with any care at all. The factory told Bill Dube that if a person can tolerate a loss of 50% capacity over time, then these cells can go 10,000 cycles. Most lead packs lose 50% capacity at 200-300 cycles. For all of these reasons I’m building an industrial spot welder for making A123 modules. Not just for EV’s, but for the Combat Robotics crowd as well. They use these cells without a BMS and they still last a decent amount of time. Far less than they could, but those folks are happy with the performance and longevity. Each bare 10 cell module will be 66mm wide x 260mm long. That’s 2.6″ x 10.24″. There has to be some kind of structure built to house the module and some stout connections designed so they can be connected together into a pack. I’m thinking of making the structure look a lot like a flooded nicad cell. In fact I wonder if a nicad cell housing could be adapted as the structure. These modules won’t need to be strapped tightly together like the large format cells require so they don’t over expand and die. These cells will never expand. In theory, a 23ah pack would be 100 modules. This could fit into the Prizm battery tray. My truck holds 126 nicad cells in each half of the battery box. So it could hold 126 A123 modules per side, for a max of 252 modules per truck. The stock charger could not charge them up past 400v so only 100 modules would be fitted per side. A second 100 module pack could be added to the remaining side if desired, and wired in parallel. I have a couple of dozen A123 cells and the 10,000 amp (5 ms) microprocessor controlled spot welder is under construction. I plan to make one 10 or 20 cell module to take the place of 1 or 2 nicads in my current pack, for testing. compared to the $75+ factory brushes. math shows they will last about 60-70k miles.